Utilising the power of the sun is an excellent�alternative to traditional energy sources.�With zero CO2 emissions and an inexhaustible supply of�sunshine (even in the UK!) solar technology is good for the�environment and is an excellent way for homeowners to reduce�their carbon footprint as part of a wider lifestyle choice. Solar thermal is a clean and sustainable method of providing�homes with hot water. As with all our products the technology�is simple but highly efficient, providing an environmentally�responsible and cost effective alternative to traditional�energy sources.�Typically, a solar thermal system can save you up to 70%�on your annual hot water heating costs � so it�s good�for the planet and good for your wallet too! Solar provides an efficient and environmentally�responsible solution to the use of fossil fuels.�All our products and components are rigorously tested to ensure�the highest standards of quality and reliability and over time�deliver significant cost savings. 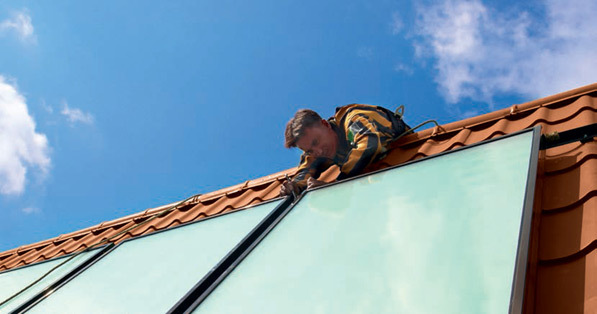 Solar collectors can be installed on sloping roofs�using either an on-roof or in-roof mounting system or on flat�roofs if required, and the self-cleaning glass keeps�maintenance to a minimum.�Read more about our award winning solar heating system, the Grant CombiSol, and the Grant WinterSol. The basic principle is easy to explain. If you leave a garden hose�on the ground exposed to the sun, in a short time the water�within will become hot.�Solar thermal collectors�work in very�much the same way, only more efficiently. 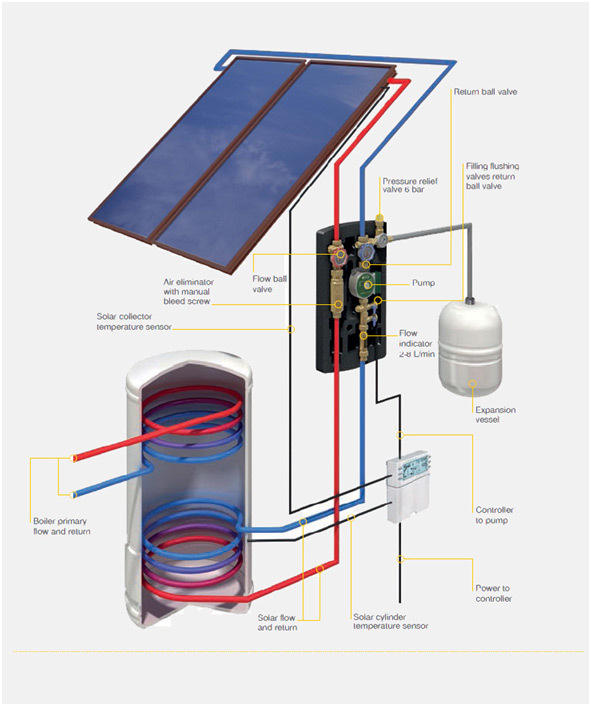 Roof-mounted solar�collectors are connected to a coil containing a special glycol/�water solution. This heated fluid is circulated from the panel to�a cylinder where the heat is transferred to produce hot water. The Grant solar controller used automates the operation of the system making ownership easy to run and stress free. The solar pump station has been designed with the installer in mind, incorporating an air eliminator and manual bleed screw for rapid air removal, without the need to bleed the panels from the roof.